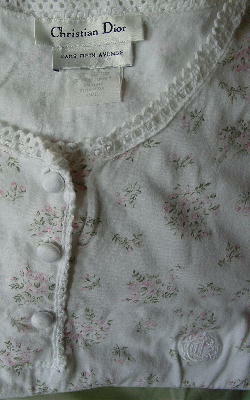 This vintage sleeveless nightwear is by Christian Dior and was sold at Saks Fifth Avenue. It's 100% cotton and was made in Turkey. 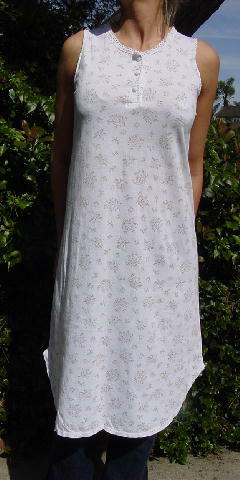 There's a rounded jewel neckline and 3 white fabric covered buttons below the neckline. 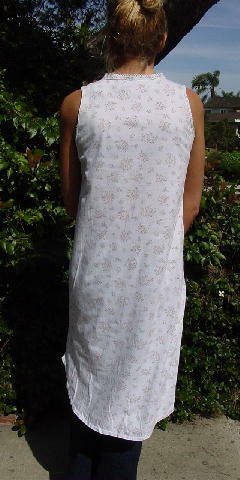 There is a white lace border around the neckline, the armpits, and along the edges of the button area. The bottom edges are rounded and go upward (4 3/4") at the side seam edges. It has a Christian Dior embroidered logo on the left chest area. There is a white background with flowers and leaves in baby pink and light olive green. It was used in photo shoots and a foreign film. shoulder to hem 37 1/2"